(Photo: Albin Hillert/WCC)Ecumenical Patriarch Bartholomew at Geneva's St Pierre Cathedral during a service celebrating the 70th anniversary of the World Council of Churches on June 17, 2018. Representatives of churches worldwide have gathered at Geneva's St. Pierre Cathedral for a service of celebration to mark the 70th anniversary of the World Council of Churches. There Ecumenical Patriarch Bartholomew, the Istanbul-based Archbishop of Constantinople urged continued efforts for unity, justice and peace. "We celebrate a long common pilgrimage on the path to unity, Christian witness, and the commitment to justice, peace, and the preservation of creation," said the Bartholomew in his homily during the service on June 17 in in the Swiss city's historic Protestant cathedral. Bartholomew was one of the founding members of the WCC, which was established with its headquarters in Geneva in 1948 to foster Christian unity with the memories of the Second World War strongly motivating its formation. But the Ecumenical Patriarch reminded those gathered that the ecumenism was linked to an even earlier human catastrophe the First World War, or the Great War as it was sometimes called during which the Russian Revolution took place. "Ninety-eight years ago, shortly after the end of the devastating First World War, a voice was raised in the Christian East, calling on the Churches of the entire oikouménè to show mutual trust between themselves and to no longer regard themselves as strangers, but as relatives and dear ones in Christ, as 'fellow heirs, members of the same body, and partakers of the same promise of God'"
Bartholomew quoted the Bible's book of Ephesians 3:6 om his homily. Today the WCC brings together 350 Protestant, Orthodox, Anglican and other churches representing more than 550 million Christians in over 120 countries. The patriarch praised common efforts to respond to the major challenges of the age, as well as the "constructive cooperation" between the WCC and the Roman Catholic Church, which is not a WCC member but works with the council in various areas. "We are aware that the movement to restore the unity of Christianity is taking new forms in order to respond to new situations and to deal with the current challenges of the world," said the patriarch Bartholomew, who is viewed as the primary spiritual leader of the Orthodox Christian world. Before he became Ecumenical Patriarch in 1991, Bartholomew served on the WCC's Faith and Order Commission and as a member of WCC governing bodies such as its central and executive committees. He is also studied at the WCC's Ecumenical Institute in Bossey near Geneva that has drawn students from all over the world including students from churches that are not WCC members. The service was held in French and English, and included hymns and prayers in many languages and from many parts of the world. It was a joint celebration with the Protestant Church of Geneva. In words of welcome, the church's president, Rev. Emmanuel Fuchs, praised the ties between his church and the "universal communion that the WCC represents." Thanking the Geneva church, WCC vice-moderator Bishop Dr Mary Ann Swenson said the cathedral symbolized the city's legacy in the defence of human dignity and of justice and peace. She noted that participants at the service included representatives from the churches in both North and South Korea. 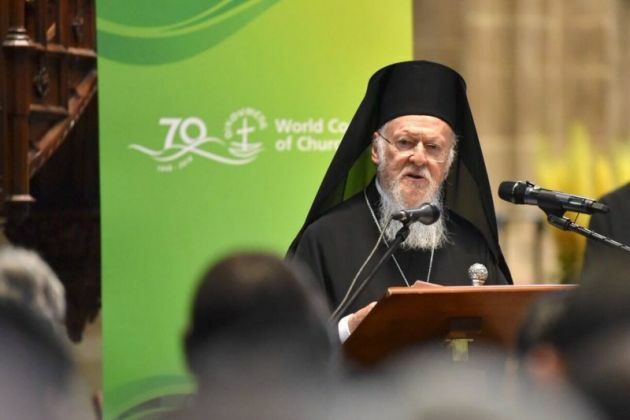 In his homily, Patriarch Bartholomew urged dialogue, patience and openness to overcome differences and difficulties that had arisen since the WCC was founded. "Let us have no illusions," he said. "The churches have so far been unable to overcome their divisions and achieve the much-desired unity." The main Christian traditions represented in the WCC – the Christian East and the churches of the Reformation - need to redefine the nature of the institution and to mark the limits within which the WCC is called to bear witness and serve, said the patriarch. He noted how the Holy and Great Council of the Orthodox Church that convened in Crete in June 2016 had affirmed that local Orthodox churches that are members of the WCC "participate fully and equally in the bodies of this institution." Bartholomew recalled 1920 when the Ecumenical Patriarchate of Constantinople had issued an encyclical to the churches in the world to create a "League of Churches" on the model of the League of Nations created in the same year in Geneva. "The 'League of Churches' proposed by Constantinople finally took on flesh and bones 28 years later in 1948," he said, when the WCC was created through the fusion of the Christian movement on "Faith and Order" and "Life and Work." On June 21, Pope Francis will visit the WCC at its Ecumenical Centre in Geneva.